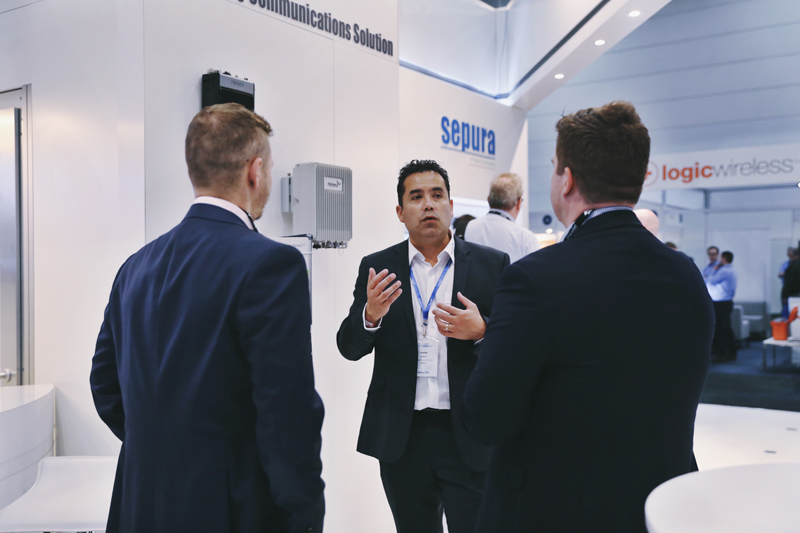 Hytera and Sepura have showcased their cutting-edge PMR communications solutions at Comms Connect Melbourne in Australia on November 21-22. Hytera, a leading global provider of innovative professional mobile radio (PMR) communications solutions, and Sepura, part of the Hytera Group and a market leader in TETRA radio technology, have showcased their cutting-edge PMR communications solutions at Comms Connect Melbourne in Australia on November 21-22. This is the second consecutive year that the company – as platinum sponsor – has represented the largest presence at the exhibition. During the exhibition, Hytera has demonstrated its convergent solution along with a series of new products, including: PDC680, the new generation of Hytera multi-mode advanced radio which will be released in the second quarter next year; PNC550, a smart PoC terminal integrating smart phone and professional Push-to-talk Over Cellular (PoC) function with 5-inch HD screen; VM550, a pocket-size body worn camera weighing just 145g - making it the ideal companion for evidence collection, and a PoC dispatch application connect with PoC terminals. 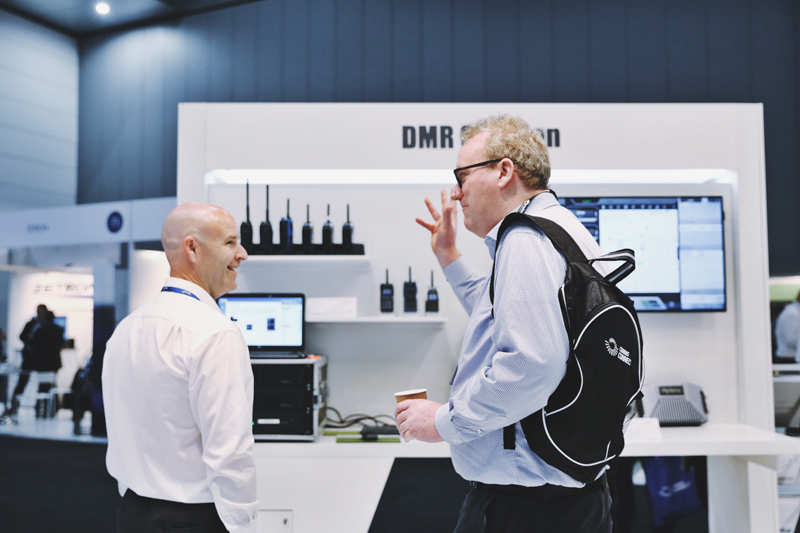 “The PMR industry is undergoing rapid evolution, and Hytera continues to demonstrate leadership in incorporating new technologies and compelling features in order to deliver more effective solutions for our customers”, said Terry Feng, General Manager of Hytera Australia. Theo Kalkandis, Sales Engineer of Sepura Australia was demonstrating SC21 to visitors. TETRA specialist, Sepura, launched a new version of its groundbreaking, lightweight SC21 terminal which operates in the 402-470MHz band. The SC21 is a smart TETRA radio, designed to be small and lightweight but with no compromise on robustness or audio quality. This SC21, and other SC2 Series radios enabled Sepura to demonstrate innovative data applications that enhance the communications and operations of organizations which employ these devices. Examples of these apps include Bluetooth-enabled functionality to monitor, for example, user wellbeing, and the timely exchange of critical data such as weather reports, which can be vital in a hazardous mining or outdoor environment. “Sepura continues to innovate to bring greater benefit to our users who depend on our products to keep their organizations communicating. Our TETRA portfolio continues to expand to the benefit of our customers”, said Terence Ledger, Sales and Marketing Director of Sepura. 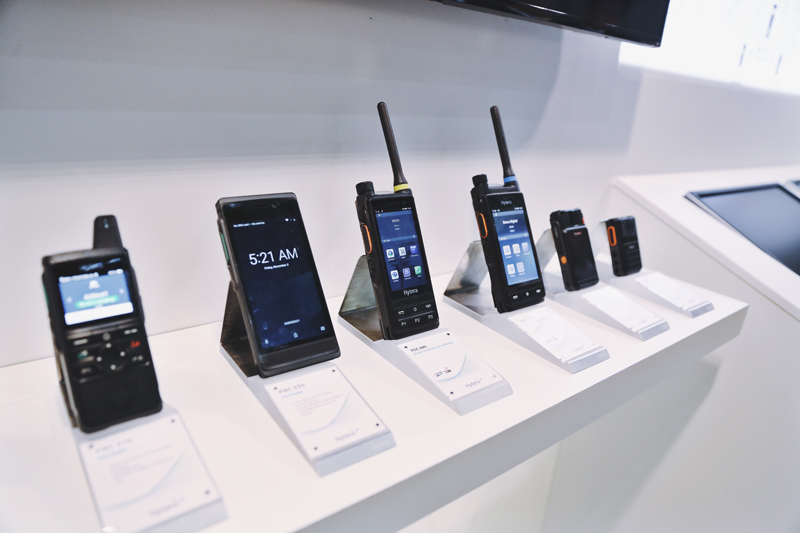 The event also gave visitors a first glimpse of the Hytera PT3 Series, a new TETRA radio developed by Hytera for users working in noisy and harsh environments like factories, ports or open mining with providing less distraction during voice communication to help with operational efficiency. The PT3 series includes common Sepura RAC interface and has compatibility with RAC-based accessories. With this inherited design, customers can re-use their existing accessories. A complete series of additional accessories are ready, including audio, carrying, power and antennas to ensure all customer use cases are catered for. The another highlight of the stand was Hytera’s Smart Outdoor section which comprised iBS, DIB-R5 outdoor, DMR Trunking Cube DS-6250 solutions. These demonstrated Hytera’s capability in developing integrated outdoor solutions. These three outdoor base stations, highly integrated solutions supporting LTE, TETRA, DMR standards respectively, are designed with fast deployment and simple operation in mind. They can be mounted indoors or outdoors, ensuring rapid installation to deliver business or critical communications. 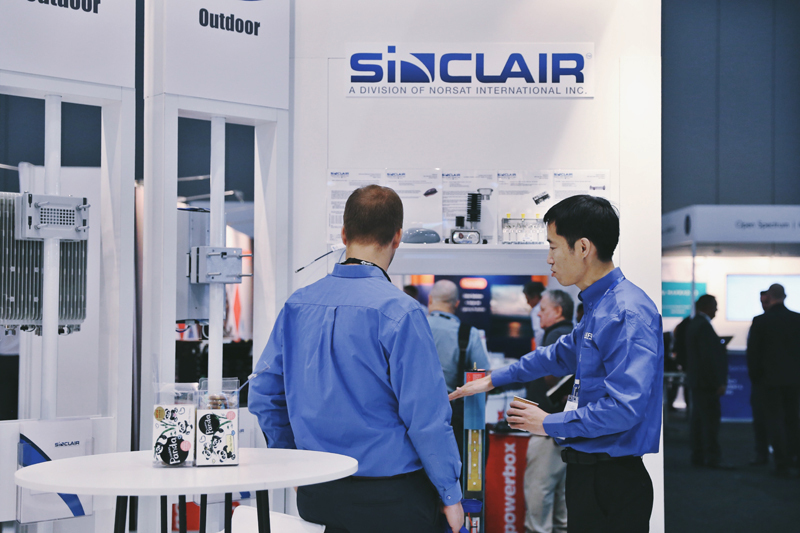 Pail Gu(right), Product Manager of Sinclair, was introducing SC366-HL antenna to visitor. 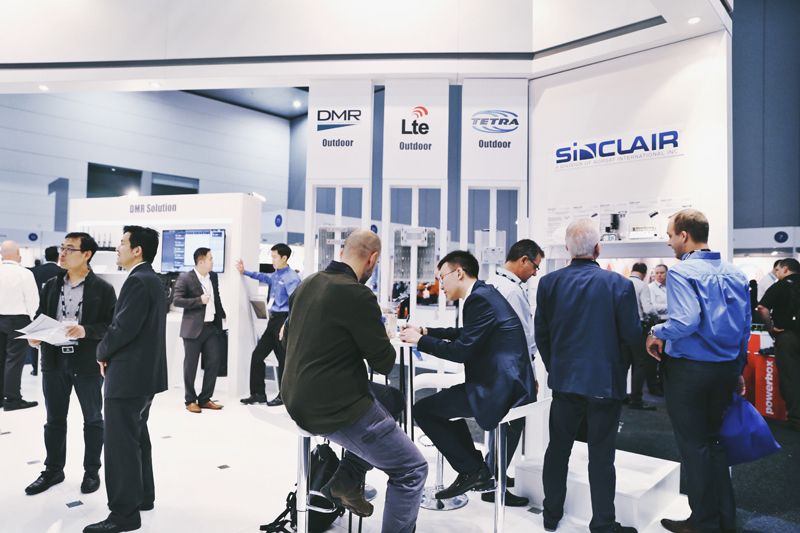 Sinclair also exhibited at Comms Connect for the first time, showcasing its full suite of public safety RF solutions, including antennas and filters. One of the key products is SC366-HL, a new UHF/TETRA product from the Aurora antenna line. The patent-pending Aurora family utilizes cutting-edge self-balancing design to deliver exceptional performance, and offers wide bandwidth, higher gain, lower profile, higher wind rating and stable RF pattern across the band. This low PIM antenna also features an integrated lightning spike that is compliant with industry lightning protection standards. Simon Mcclure(left), Sales Engineer of Hytera Australia，was presenting SCADA modem to customer. 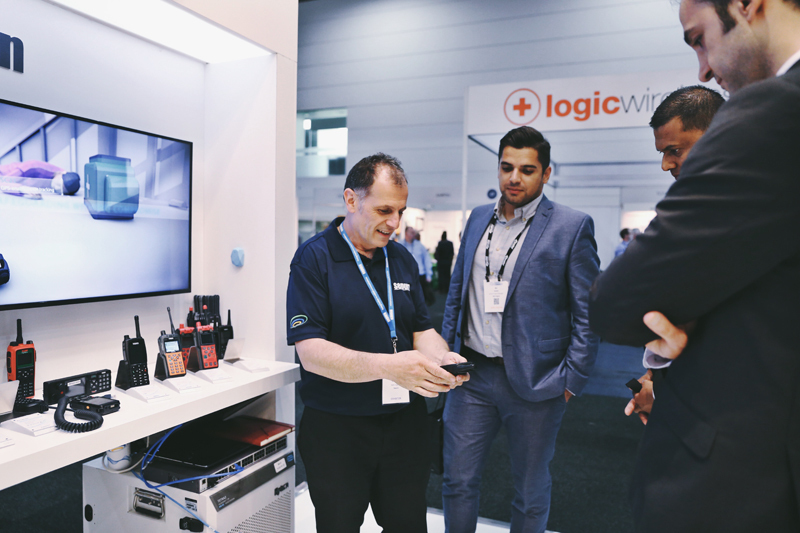 Frank Armijo(middle), Channel Business Director of Hytera Australia, was introducing Hytera Emergency Communications Solution to the customers. 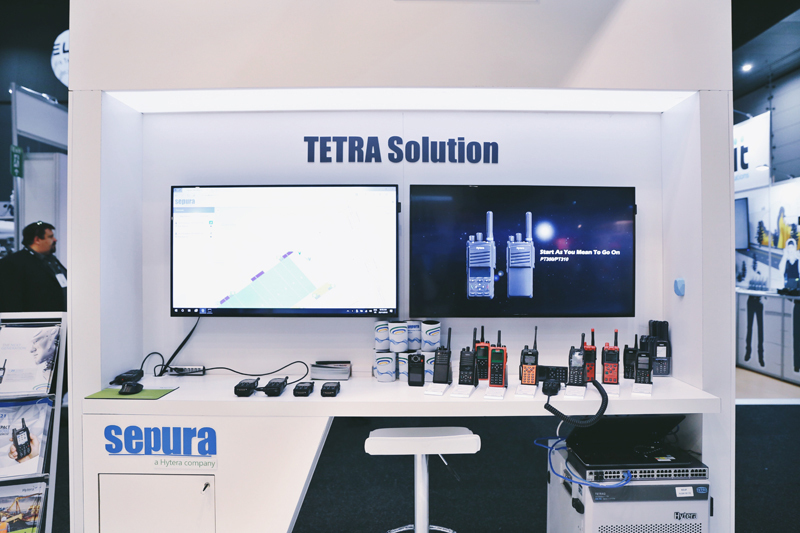 Hytera also displayed its new SCADA modem, the ‘DTM-6000’, which can operate two 10/100Mbps IP/Ethernet ports and serial and IP/Ethernet ports simultaneously, in the DMR Solutions zone, and the ‘iMesh’ Ad-hoc Broadband Network Solution in the Emergency Communications Solutions area. 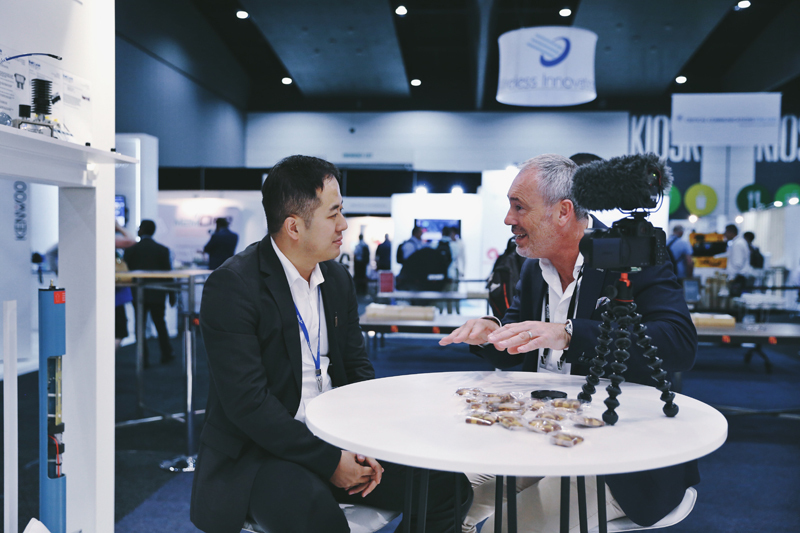 Terry Feng(left), General Manager of Hytera Australia, was in an interview with Gert Jan Wolf(right) from Critical Communications Review. Comms Connect Melbourne is the largest event for the critical communications sector in Australia. Held over 3 days at Melbourne Exhibition Centre, Melbourne, the exhibition is a mix of exhibitors, thought leadership and networking opportunities. The exhibition delivers countless opportunities to seek out new technology, to share ideas and to make new contacts.